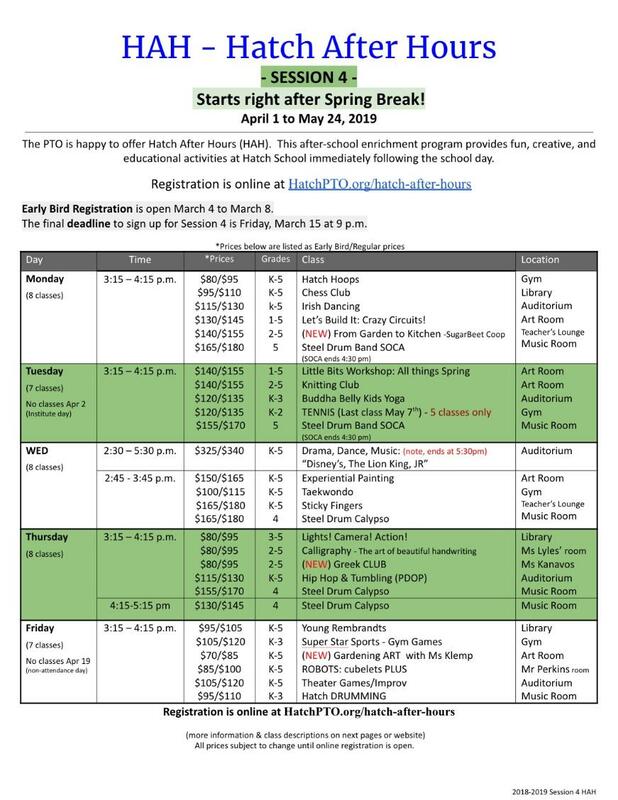 Here is information relating to Session 4 (April 1 to May 24, 2019) of Hatch After Hours. The final deadline to register is March 15 at 9pm.To download the full catalog click here. To register, please click the "Catalog and Register Here" button below. Hatch PTO is proud to offer After School Enrichment Classes at Hatch. This program is called: Hatch After Hours (HAH). HAH has a great team of parent volunteers that work hard to offer and manage enrollment in great options for the program. HAH offers 4 Sessions a year of fun and learning in a variety of areas. There’s something for everyone! Science, Sports, Drama, Music, Culinary, Dance, Games, you name it. We try hard to make it accessible for every student by keeping prices down and offering scholarships year-round. More information on what’s offered and registration is available on your PTO Sunday Newsletter: Hatch Happenings, as well as on the Digital Backpack. Also here is a link to our HAH FAQ. If your child will be absent from a HAH program, please send an email with the subject Attendance - HAH to Ms Winfield at pwinfield@op97.org. 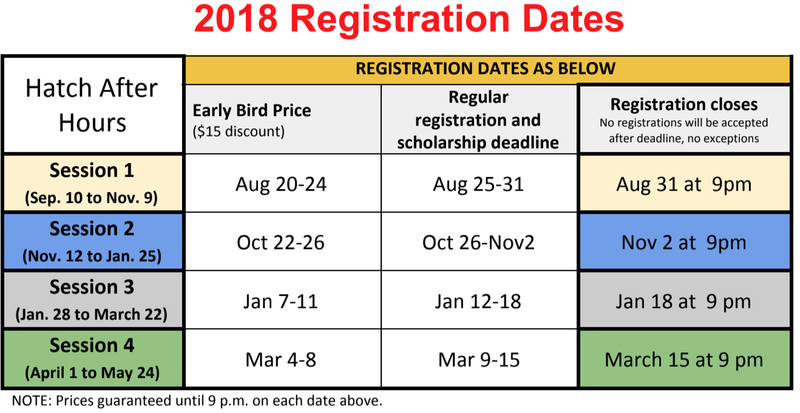 It has all deadlines, start and end dates of sessions, Early bird and regular registration start/end dates. WHEN: 4 Sessions a year. About 2 months (8-9 weeks) per session. Please send a nut-free snack for your child. Some classes are taught by vendors, others by our own Hatch teachers and parents. HAH and its classes are not sponsored by District 97. HAH reserves the right to change or cancel any classes due to low enrollment or other unforeseeable events. HAH is a full volunteered run effort to provide families with extra curricular activities. Your constructive feedback are highly encouraged.